I left the dock at 6 tonight to beautiful fall like conditions. My plan was to get out to the point a little earlier tonight since low tide was predicted for 8:30. I only made one stop, at the Brown House, where I picked up a 18. Anchored up next to Mild Bill at "the spot" around 6:45. I figured that the outgoing tide should still be strong, but was surprised when the ships were all in various stages of a swing around. The tide was basically slack. It did not take long for the the first blow up to ocuur. I had the fish on for several excellent jumps before he threw the plug. The next cast resulted in another very good blow up from what appeared to be a bigger fish. It turned out to be a 24 that looked like it was on its way to the great beyond. That was basically it for the night. 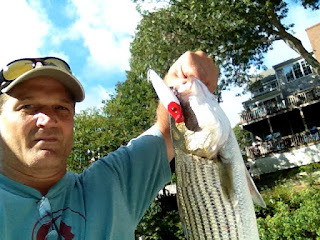 I had meaning to post a picture of my buddy from Boston, Joe, who texted me a picture of a nice "Bass" he caught off his pier on Cape Cod using my beloved Papa Dogg, that he had seen in all his glory during our trip North. I look to see Papa to go international by the end of the year when my wife and I head to the BVI's. Thanks for the blog, it's very enjoyable and useful. I'm putting my boat on the South river starting this weekend so maybe we'll see each other. I fish light tackle and fly so sort of the same idea as you. Welcome to the river Mike. Anytime you want to ride along, let me know. Thanks Rick, that's very nice of you. If you see a yellow parker that's me.